Down on his luck, behind on his alimony and bank payments, cowboy Jim Kane agrees to bring back a herd of cattle from Mexico for a crooked rodeo supplier. Teaming up with his crafty friend Leonard, they set about trying to buy and ferry their cows across country, but this proves easier said than done. In a section of his book Genre and Contemporary Hollywood, Steve Neale identifies several distinct trends or “cycles” in the Western as it developed after what is seen as its golden, Fordian age (from the dime store classicism of Stagecoach  through to the psychological acuity of The Searchers  and on to the revisionist amends making of Cheyenne Autumn ) (1). During this period of decline, Neale suggests, the steep drop-off in the production of Westerns (18 % less than the mid to late 1950s by only 1963 according to Ed Buscombe) (2) was masked by the notoriety and/or success of several new and different types of films within the genre. So, alongside TV series such as Bonanza, Rawhide and The Virginian, other forms of the genre arrived and evolved: Italian spaghetti Westerns popularised by Sergio Leone; revisionist “Vietnam” Westerns, like Arthur Penn’s Little Big Man (1970), Robert Aldrich’s Ulzana’s Raid (1972) and Soldier Blue (1970); modernist or deconstructionist works such as Sam Peckinpah’s The Wild Bunch (1969) or the Westerns of Robert Altman. Augmenting the stoically, often stolidly backward looking films of John Wayne (True Grit, 1969, The Undefeated, 1969, Big Jake, 1971, and Rooster Cogburn, 1975), were two further off-shoots of the genre; the comedy or parodic Western and the modern day Western. Pocket Money (1972), directed by Stuart Rosenberg from a screenplay by Terrence Malick, has been categorised within both of these sub-genres. The comedy Western has appeared sporadically as a sub-genre since the early years of Hollywood, from Douglas Fairbanks’ Wild and Woolly (1917) and Buster Keaton’s The Goat (1921) to George Marshall’s Destry Rides Again (1939). However, it is not until the late 1940s that it becomes a truly significant sub-genre of the Western, stretching from the Bob Hope films The Paleface (1948) and Son of Paleface (1952) to George Roy Hill’s Butch Cassidy and the Sundance Kid (1969), Mel Brooks’ Blazing Saddles (1974) and Lawrence Kasdan’s Silverado (1985). Pocket Money‘s comedic angle comes mainly from its focus on a bumbling, naïve and honest-to-a-fault cowboy who can’t quite live up to the stereotypical image. This is illustrated by his distinctly unprofessional rodeo riding, as well as such scenes as the one set outdoors at night in which he tries to frighten away cattle rustlers by firing his gun into the air rather than heroically confronting them. Added comedy comes from the incredibly canny casting. The central character, Jim Kane, is played by Paul Newman, and a familiarity with the dark, psychological loners and outsiders he played in the Westerns The Left-Handed Gun (1958, as Billy the Kid), Hud (1962) and Hombre (1966) helps bring a certain piquancy to the ineffectual, perpetually “Sinned against” (to quote the bard) idealist he plays here. Similarly, although he had begun to branch-out by this time into comedy and even musicals (Paint Your Wagon, 1969), Lee Marvin, who plays Kane’s partner Leonard, was still largely known for the career-making succession of sadistic villains he played: most obviously in Fritz Lang’s The Big Heat (1953), the modern Western Thriller Bad Day at Black Rock (1954), and the more classical (if, at times, revisionist) Westerns Duel At Silver Creek (1952), Seven Men from Now (1956) and The Man Who Shot Liberty Valance (1962). As with Newman, Marvin’s established star persona causes comedic friction with the actual character here: a shambling, half-drunken figure whose hard-bitten, self-confident façade masks a similar ineffectuality to that of his straight-laced buddy. 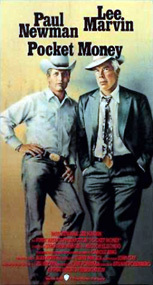 However, with the exception of Butch Cassidy and the Sundance Kid (which can be seen as a precursor to this film, with its mismatched buddy duo, elegiac tone and quasi-Peckinpah nostalgic thematic) and Burt Kennedy’s The Rounders (1964), Pocket Money takes an essentially different track from most comedy Westerns. For one, it is gently rather than overtly comic, with the jokes arising organically from a sure sense of character and narrative rather than from the lampooning of stock generic types and situations. Also, the film tends to take (more or less) seriously some of the themes that are common to the Western as Peckinpah, in particular, envisioned it – but also central to several John Wayne films such Ford’s The Man Who Shot Liberty Valance and his final film Don Siegel’s The Shootist (1976). The theme of cowboys as anachronisms, characters out of time. It also has a story – that of the cattle drive – familiar to the Western (notably Howard Hawks’ Red River, 1948). And, in Laszlo Kovacs’ (who shot Easy Rider, 1969) golden, autumnal photography, a look that could have graced any Peckinpah or Eastwood picture. All of this leads to the other “post-Western” category or sub-genre into which Pocket Money fits: the modern Western. Just as Newman (in Butch Cassidy and the Sundance Kid) and Marvin (in Cat Ballou ) had both appeared in comedic Westerns, so both had already given career-best performances in modern Westerns: Newman in Hud and Marvin in the hugely underrated Monte Walsh (1970). These films, along with John Huston’s The Misfits (1961) and David Butler’s Lonely are the Brave (1962), all take the disappearance of the ways of the old West as a central concern. However, as in its relation to the comedy Westerns, Pocket Money doesn’t fit perfectly alongside these works either. Certainly it contains the theme of the anachronistic cowboy eking out an existence in the indifferent modern world. But scriptwriter Malick and director Stuart Rosenberg (whose third film with Newman this was after Cool Hand Luke  and WUSA ) don’t share the tragic lament for the passing of the old, heroic America that characterises the works and filmmakers noted above. Indeed, Pocket Money‘s characters look forward much more than backwards. And, at the end, as the two losers wait at an empty station for a train that doesn’t look like coming, one can almost recall Samuel Beckett’s Waiting For Godot. The characters may as well have spent the whole narrative at that lonely outpost for all they ultimately achieve, and an absurd sense that they may as well stay there (and perhaps figuratively will) prevails. who yearns to make for himself a better world (ambitions that also spur on Kit in Badlands and especially Bill and the Farmer in Days of Heaven). In Pocket Money there is the sense of a generic base being undercut and to some extent undermined, a characteristic that is also particularly central to Badlands and The Thin Red Line; although a powerful sense of what the genre is being subverted for and the presence of a vision that alternately structures the film, is missing at this stage. Steve Neale, “Westerns and Gangster Films Since the 1970s”, Genre and Contemporary Hollywood, ed. Steve Neale, BFI, London, 2002, pp. 27–31. Ed Buscombe, “The Western: A Short History”, The BFI Companion to the Western, ed. Ed Buscombe, Andre Deutsch/BFI, London, 1988, p. 48. Welcome to Issue 30 of our journal! Welcome to Issue 31 of our journal! Adam Bingham h as contributed several articles to Senses of Cinema over the years.